Canterbury Enclave Islamabad is a recently launched residential project which has been developed by National Developers. The project has been designed to give the inhabitants of Islamabad a stylish and modern living where they can get all the amenities at your doorstep. It is a very grand residential project which offers the best living facilities and a favorable environment to live ideally. A lavish and elite lifestyle is obtainable to all now with the best amenities and modern approach. The charges of plots are also very reasonable through which many average people can elevate their lifestyle new heights. The advanced infrastructure and high development status have made it one of the top projects of Islamabad. The best quality and class is available to those who crave to have it. An energetic, facilitated and unforgettable lifestyle is guaranteed by Canterbury Enclave Islamabad. With the world-class and modern amenities, it is a perfect place to live and invest. You will get a class and advantageous output of your money here. It is a time to own a standardized existence with unconditional elegance and contentment. More than enough facilities and latest amenities which you have dreamed of. The best quality and elegance is available to those who want to have this. You will get a desirable living experience here. From its high status and top-infrastructure, you will get the best output of your money either in form of an ideal life or golden returns in investments. A classy lifestyle with desirable status in the current time is promised by this place to people. It is the best regal and deluxe place to provide you with a desirable living with the best services and quality. Canterbury Enclave is an ideal and dream place to settle well with your beloved family where your life will make sense and meaning to you. The Canterbury Enclave has been designed with modern architecture and master town planning where every single detail of the project has given particular attention. The project is one of the mega housing schemes of Islamabad which is spread over a land of 757 Kanal. The project is offering residential plots of 7 Marla, 10 Marla and 1 Kanal featured with all contemporary facilities. The all modern day services. You can choose according to your family needs and demands from these options. Canterbury Enclave is one of the greatest housing schemes of Islamabad which has been developed on a vast area of 757 Kanal with the approval of CDA. Many housing schemes face troubled and challenges because of their illegal status. This is not the case with Canterbury as it is developed according to the legal procedure and documentation. It is an approved society which enjoys a legal status in the market. People can buy a place here without being troubled about such issues. 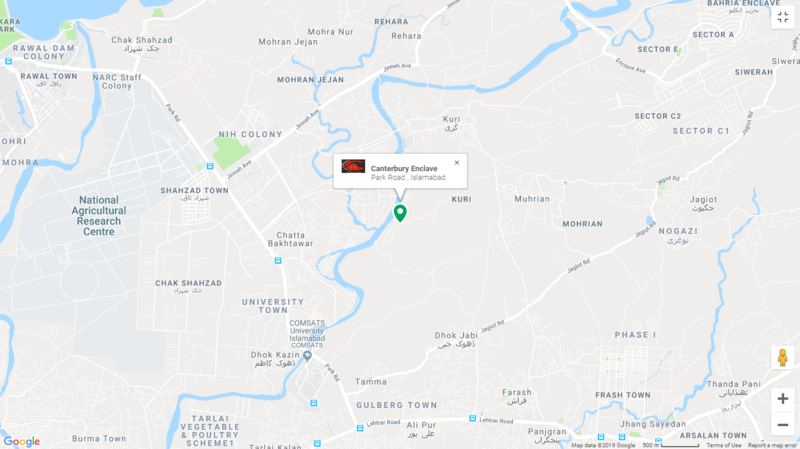 Now talking about the most remarkable feature of any real estate project that is location, the Canterbury Enclave has been positioned at the best perfect place of Islamabad. It is positioned at the most drastic location of Jinnah Avenue. This outstanding project is situated at opposite to Park Enclave on in Zone 4, Islamabad and has convenient access from Kashmir Highway, Lehtrar Road, and Islamabad Highway. The location is ideal and found at the distance of just 5 minutes’ drive from Islamabad Club and COMSAT Institute of Information Technology. This drastic location contributes greatly to its popularity and demand. the market value of this location and properties here have increased very much and it is still increasing. The benefits are enormous to live at this strategical location with all the facilities closely obtainable. Many developments are going on here and many have completed. It is an ideal as well as the beautiful region of Islamabad where peace and luxuries go hand in hand. More future growth in the coming time is expected in commercial and residential activities, business, population and infrastructural development. The project is offering a comprehensive range of residential plots of 5 Marla, 7 Marla and 10 Marla with a 2 years instalment plan. Canterbury Enclave with its easy and convenient payment policies and plans, make it easy for average people, to make sound investments. Without being troubled about high costs, now a lifestyle can be shifted to high levels. The payment plan has been announced by the developers and all the properties are reasonably priced. Investors and clients are very attractive to this place because of the convenience and high-class this place is offering. It is not a place only for elite class but also for average people. The booking is now open for all sizes of Plots and can be made in cash payment or instalments basis. To book any property the investor will be required to pay 20% of the total amount as a down payment while the balance amount will be payable in 24 monthly instalments. The detailed payment plan is given below for you! National Developers is one of the most famous and leading Construction and Real Estate Development Company which has presented many commercial and residential projects. The recently launched project by National Developers is Canterbury Enclave a beautiful and outstanding residential housing project that will be offering a range of civilities within a gated community. It is a very well-known name of real estate who always delivered quality and high standards in their projects. The global and distinctive approach in the very matter makes them a prominent name. Reliability and care for people are at the core of them. The professional designers and architectures have established this place with elegance and make it the tremendous addition to the real estate of Islamabad. Everything is done here according to the modern trends and global approach. The professional approach is evident from the high establishment of Canterbury Enclave while it is a perfect illustration of excellence and brilliance of the developers. If you are the one with the dream of exclusive and royal living, then book your place now in Centurbary Enclave. It is a perfect place to live and invest with so many options available to you. You will find a desirable life with high status in the society. One visit to this society is enough to fall you love and desire to live here. Everything is so very well-established at the top-class and beautiful location of Islamabad. 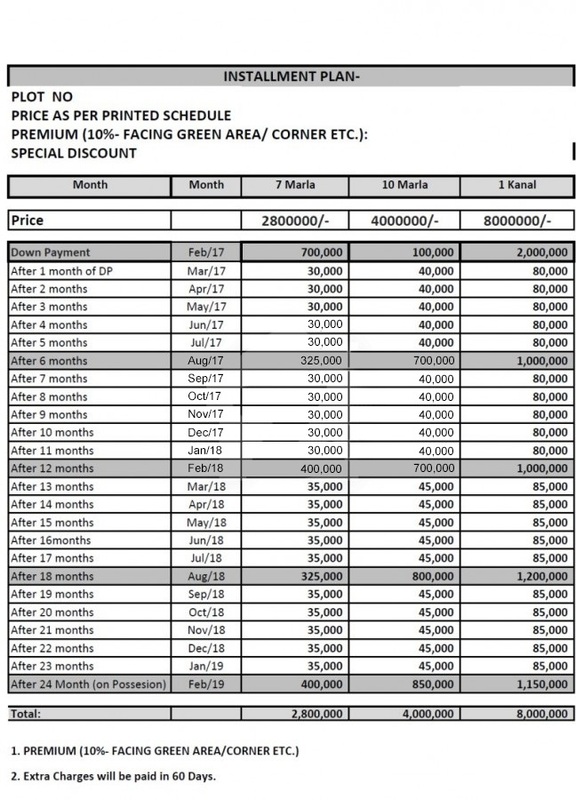 Flexible payment plan when joins all this then the attractiveness increases more. Book now to live at this worth living land!